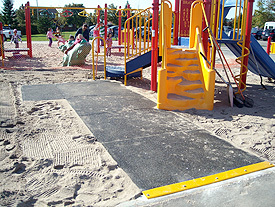 It has been said that sand playgrounds cannot also be accessible. Nothing could be further from the truth. Now there is a sand system that combines accessibility with playability. Accessibility through the removal of barriers for people of all ages has long been a goal and is becoming a requirement of legislation and regulation. Hutcheson Sand has proven itself as having excellent properties in the playground for the prevention of injuries and is a valuable part of play in any playground and should not be precluded from use in the balance of the playground that doesn’t have an accessible route. For the Ground Level Accessible Route, Hutcheson offers the PlayMat surfacing system that can be installed at the same time as the Hutcheson Sand in the balance of the playground by Hutcheson trained crews or can be added at a later date. The PlayMats are 1524mm (60″) wide, the width of the Ground Level Accessible Route, and can be installed as modules connecting accessible elevated and ground level components. This can be in a straight or angular configuration. The PlayMats have been tested within the Hutcheson Sand system to a drop height of 3.6M (12′) and passed the requirements of section 10 of the CSA Z614-07. The PlayMat is installed with a specially designed threshold to ensure that there is no change in vertical level or gapping at the interface of the PlayMat with the exterior of the Playspace. Maintenance of the Hutcheson Sand and PlayMat system is very easy. The Hutcheson Sand does not become tracked easily, but should the sand start to accumulate on the PlayMat, the CSA Z614-07, Annex H allows for a change in vertical height of 1″, and there is time to provide a maintenance schedule to sweep or blow the sand off. The square edge of the PlayMats provides a visual clue as to when the adjacent height of the sand requires adjustment. The sand does not compact and is easily adjusted to the edge of the PlayMats.